PRTG offers single failover clustering in all licenses—even using the freeware edition. 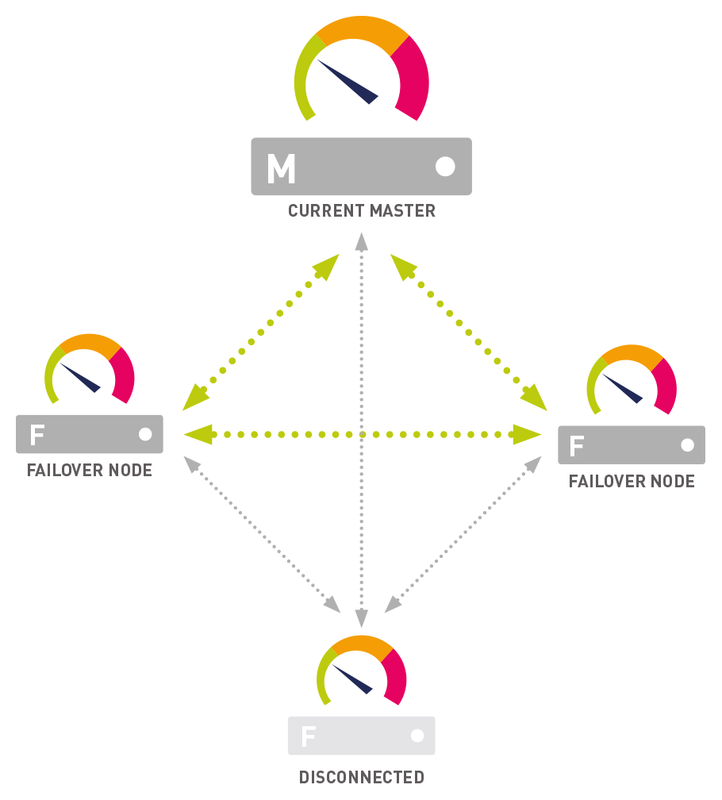 A single failover cluster consists of two servers ("Current Master" node and "Failover" node), each of them running one installation of PRTG. They are connected to each other and exchange configuration and monitoring data. For setting up a cluster you need two or more servers and there is one core installation necessary on each of them—with different settings configured for each type of node. In return, you benefit from seamless high-available monitoring with automatic failover and/or multi-location monitoring. On the master node, you set up your devices and configuration. Also notifications, reporting, and many other things are handled by the master node. You can install one, two, three, or four additional nodes for fail-safe, gapless monitoring. For more than one failover node you need additional licenses. Each of these nodes can monitor the devices in your network independently, collecting their own monitoring data. You can review the data in a summarized way, which enables you to compare monitoring data from different nodes. Note: During an outage of one node, you will see data gaps for the time of the outage on that node. However, data for that time span will still be available on all other cluster nodes. Configuring a cluster with one failover node is the most common way to set up a seamless network monitoring with PRTG. You will need two servers running any Windows version (Windows 7 or later). Your servers can be real hardware (strongly recommended!) or virtual machines. For details, please see section Detailed System Requirements. Your servers must be similar in regard to the system performance and speed (CPU, RAM memory, etc.). We recommend installing PRTG on dedicated real-hardware systems for best performance. Make your servers safe! From every cluster node, there is full access to all stored credentials as well as other configuration data and the monitoring results of the cluster. Also, PRTG software updates can be deployed through every node. So, please make sure you take security precautions to avoid security attacks (hackers, Trojans, etc.). You should secure every node server the same careful way as the master node server. We recommend that you stay below 5,000 sensors per cluster for best performance in a single failover. For each additional failover node, divide the recommended number of sensors by two. Note: If you use remote probes outside your local network: You have to use IP addresses or DNS names for your cluster nodes that are valid for both the cluster nodes to reach each other and for remote probes to reach all cluster nodes individually. Open the System Administration—Cluster settings and adjust the entries for cluster nodes accordingly so that these addresses are reachable from the outside. New remote probes try to connect to these addresses but cannot reach cluster nodes which use private addresses. Note: If you use Network Address Translation (NAT) with remote probes outside this NAT: You have to use IP addresses or DNS names for your cluster nodes that are reachable from the outside. If your cluster nodes are inside the NAT and the cluster configuration contains internal addresses only, your remote probes from outside the NAT will not be able to connect. The PRTG core server must be reachable under the same address for both other cluster nodes and remote probes. A remote probe connects only to the PRTG core server with the defined IP address when starting. This PRTG server must be the Primary Master! Note: You can use remote probes in a cluster as described above, which is showing monitoring data of all your probes on all nodes in your cluster. However, you cannot cluster a remote probe itself. To ensure gapless monitoring for a specific remote probe, install a second remote probe on a machine in your network next to the existing probe, and create all devices and sensors of the original probe on it. For example, you can clone the devices from the original probe. The second probe would be a copy of the first probe then and you can still monitor the desired devices if the original probe fails. Note: Probes that send data to all cluster nodes result in increased bandwidth usage. Choose the option Probe sends data only to primary master node in the Administrative Probe Settings for one or more remote probes to lower bandwidth usage if necessary. Note: Please check explicitly on each cluster node if a remote probe is connected. PRTG does not notify you if a remote probe is disconnected from a node in the cluster. For example, log in to the PRTG web interface on a cluster node and check in the device tree if your remote probes are connected. Ready to get started? Please go to Failover Cluster Step by Step!